Obviously, the best way to avoid crowds at Walt Disney World is to go during "off-season". Historically, attendance was typically low during September up to Thanksgiving week, two weeks prior to Christmas, and the week after New Year’s up to Washington’s birthday. However, it seems Disney has caught on to this, creating a plethora of events such as Run Disney race weekends, and extending the Holiday party schedules for Halloween and Christmas. In addition, the Food and Wine Festival is getting longer and longer each year to draw in more visitors. It seems that the "off season" is now a thing of the past. Don't worry, though, you can still have a wonderful time with some planning ahead! It’s always a good idea to have a plan. Figure out what rides/shows you MUST do, what rides/shows you’d like to do and what you can miss. Remember Walt Disney World is a BIG place. Unless you’re staying on for a month or so, chances are you are NOT going to be able to see it all and do it all. But if you have a plan, you should be able to accomplish most of what you want to do and avoid long waits. While others are trying to decide where to go first, you can walk over to the ride of your choice. Knowing where you’re going is definitely the way to go. The addition of FastPass+, while frustrating for some, has increased most visitors ability to hit their "must do" attractions, relieving some of the stress of planning your days. As long as you can plan early enough to take advantage of the pre planning window (60 days for Disney Resort Guests, 30 days for off property guests), you can formulate a rough plan and "lock in" those must do rides. Each park also has an information stand which displays wait times for shows and rides. Now, you can also use the My Disney Experience App to view real time waits, schedule or modify your fast pass selections, and view the park's entertainment schedule. The app is remarkably accurate, when it is working properly. Tip: Try not to rely on the in park Wi-Fi signal when using the app if you have a large enough or unlimited data plan with your cell carrier. Your cell network will work more reliably, in most cases, than the in park wi fi. 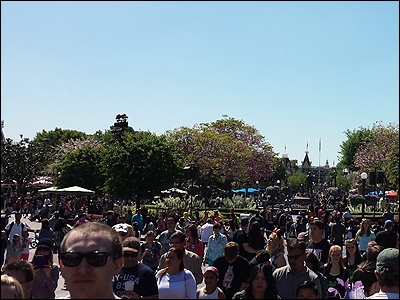 The parks usually hit peak capacity between 11 AM and 3 PM. It’s also the hottest part of the day during most of the year, the time when tempers can really flare up, even in the happiest place on earth! This is a good time to take a break and go back to your hotel and rest or enjoy the pool. Return to the park after 4 PM, when more people are leaving the park than are entering. If you’re going to stick it out and spend a whole day in the park, make sure you take a break. If you’re going to eat in the parks, make Advanced Dining Reservations as soon as you can. This will mean less waiting time for you when you get to your restaurant. If you eat early (lunch before noon) or late (lunch after 2 PM), you are less likely to get stuck with a crowded restaurant. To avoid long lines at rides, go when the parades or evening fireworks are scheduled. Everyone will be lined up to watch the event and lines for rides will be minimal. If you want to see any of the parades in the Magic Kingdom and avoid the crowds, DON'T line up on Main Street. Try watching from Liberty Square or Frontierland. At the end of the day when the park is closing, take your time. Everyone is rushing for the buses, boats and/or monorails. Why should you be caught in the crowds? Enjoy the shops of Main Street or Hollywood Blvd. Take in the early evening flora and fauna of the Animal Kingdom. Or enjoy the fountain in the center of Epcot. Part of the fun of WDW is relaxing and enjoying your surroundings. Tired of the crowds, but you don’t want to leave the parks? There are some places in each park that are traditionally less crowded, calmer and/or cooler. Spaceship Earth, The Seas with Nemo and Friends, Universe of Energy, Gran Fiesta Tour, Wonders of China, American Adventure, Impressions de France, O Canada! Pangani Forest Exploration Trail, Wildlife Express, Conservation Station, Flights of Wonder at the Caravan Stage, Finding Nemo stage show, Lion King stage show. If it all gets to be too much at any of the parks, find the nearest bench (preferably shaded), plunk yourself down and people watch. Grab an ice cream or cold beverage. Take in your surroundings and take a few deep breaths. Relax, you’re in Walt Disney World!